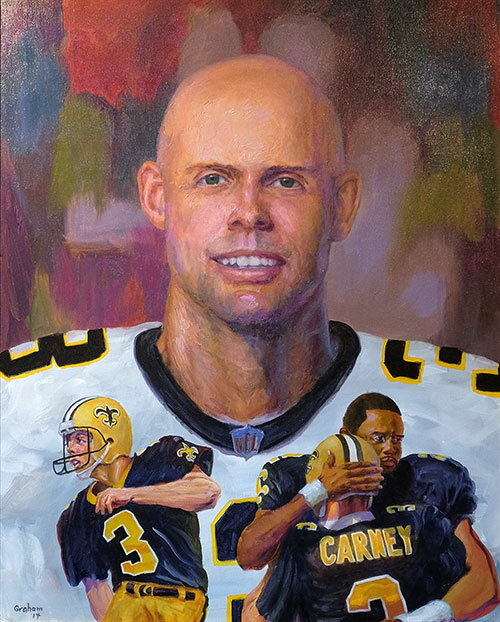 Background: One of the most prolific kickers in NFL history, Carney signed with the Saints as a free agent prior to the 2001 season. On December 21, 2003, the Saints were trailing the Jaguars 20-13 with 7 seconds left in regulation. Quarterback Aaron Brooks threw the ball in a hurry to Donte Stallworth. As time expired, the Saints continued to lateral the ball around until eventually wide receiver Jerome Pathon scored a touchdown in what became known as the River City Relay. Carney was sent out to kick the extra point to tie the game up and force overtime. Instead, Carney pushed the ball wide right as the Saints would lose 19-20. Carney kicked a game-winning field goal against the Carolina Panthers following Hurricane Katrina. He then appeared on the cover of Sports Illustrated with quarterback Aaron Brooks on September 19, 2005 as the city celebrated this victory. Carney has also been a member of the Tampa Bay Buccaneers, San Diego Chargers, New Orleans Saints, Los Angeles Rams, Jacksonville Jaguars, Kansas City Chiefs, and New York Giants. He was a Pro Bowl selection with the Chargers in 1994 and with the Giants in 2008. When he was released from the Saints' active roster in December 2009, Carney was third on the NFL career scoring list with a career total of 2,044 points. He was the last remaining player from the 1980s still active in professional football.